Little Jack- Unicorn Plate 40mm 5gr #04 900444 13.80лв. Little Jack- Unicorn Plate 40mm 5gr #05 900451 13.80лв. Little Jack- Unicorn Plate 40mm 5gr #06 900468 13.80лв. Little Jack- Unicorn Plate 40mm 5gr #02 900420 13.80лв. It is no exaggeration to say that its form and its amazing flying distance are attributed to "lead Vibe". We have realized the form of a small fish realistically, as well as its miniaturization. Its "plastic vibrations" are no different from those of the genuine fish. Furthermore, we have achieved the "line eye" for "nabla hitting". ■　Lead alloy accounts for 90% of the main body that has realized the greatest jump ever seen in the industry, one that rivals that of the metal jig. 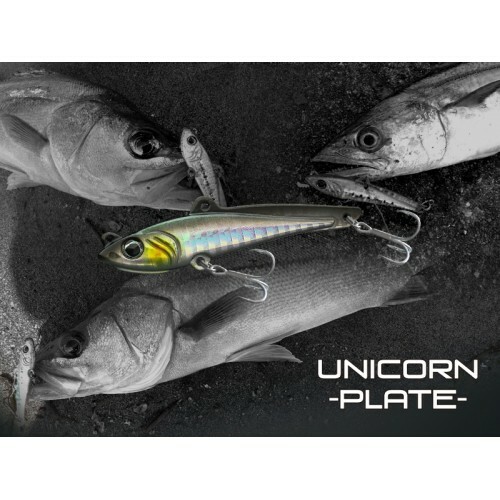 ■　Equipped with the Unicorn Two-Way Eye that could be used like the "vibe eye", as well as metal jig for vibrations. ■　We have achieved even greater appeal by customizing the blade.